Vincent van Gogh (1853–1890) is one of the most popular and universally recognized artists of all time. A remarkably prolific artist, he produced approximately 900 paintings and 1,100 drawings during a brief career spanning a mere decade. Following a succession of jobs, including a position as an art dealer, he moved in 1880 to the Borinage region of Belgium to work as a lay missionary among the miners. It was there that he decided to become an artist. Largely self-trained, in 1886 he moved to Paris, where he spent three months in the studio of the painter Fernand Cormon. He also made the acquaintance of a number of avant-garde artists including Paul Gauguin. Following two fruitful but emotionally draining years, he left Paris and moved to Arles, a town in southern France. Deeply inspired by the sun-drenched landscape and the picturesque character of the region and its inhabitants, Van Gogh developed what would become his signature style, marked by lush impasto, energetic brushwork, and vibrant color. In May 1889, the emotionally troubled artist voluntarily admitted himself as a patient at the asylum of Saint-Paul-de-Mausole in nearby Saint-Rémy, where he remained for a year. In May 1890, he moved to Auvers-sur-Oise, where he stayed until he took his own life two months later. Green Wheat Fields, Auvers was painted during these final months in Auvers. In this village just north of Paris, Van Gogh painted the Romanesque church, the town hall, and some of the picturesque thatched-roof houses. As he did in the countryside surrounding Arles and Saint-Rémy, he also painted more or less "pure" landscapes. This work is indeed singular in that there is no legible motif beyond the grassy field, road, and sky, no animals or figures, but instead lush flora whipped up by the wind. Two-thirds of the composition consists of the field in a rich range of greens and blues, punctuated by outbursts of yellow flowers. The artist wrote of his return to northern France as a kind of homecoming, a peaceful restoration in which the vibrant, hot colors of the south were replaced by cool, gentle hues in green and blue. Van Gogh's energetic strokes describe the movement of grassy stalks in the breeze, their patterned undulations creating a woven integral form anchored at the right by a juncture of field, road, and sky. There the turbulent vibrations are held in place, just barely. Over the scene the clouds whip around in spinning circles, opening out and closing in, Van Gogh's brush squiggling across the surface in broad calligraphic strokes. The paint is applied in thick impasto, creating the textured surface of Van Gogh's best-loved paintings. Through his dynamic touch and vivid, rich color, Van Gogh expresses the intense freshness of this slice of countryside. 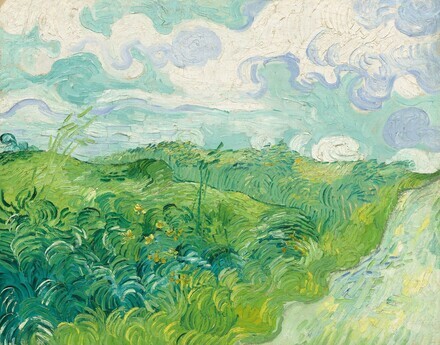 Green Wheat Fields, Auvers is a marvelous complement to the Gallery's Van Gogh collection. The ninth oil painting by the artist to come to the Gallery, it along with Girl in White represents Van Gogh's wildly prolific Auvers period. It hangs in the Gallery's West Building (M-83 gallery) with several works from Provence, including La Mousmé and Farmhouse in Provence, as well as from his stay at Saint-Rémy, where he painted Roses and his glowering Self-Portrait. This powerful landscape relates perhaps even more strongly to three of the Gallery's pen and ink drawings by Van Gogh, all from 1888—Harvest, The Harvest—The Plain of La Crau, and Ploughman in the Fields near Arles—in the rhythmic weave of the marks made to describe his sense of nature's unifying energy. The painting spent its early life in Germany, represented about 1905 by the brilliant modern art dealer Paul Cassirer and moving to Britain with F. H. Herrmann in 1936–37. Herrmann sold it through the Carstairs Gallery in New York to Paul Mellon in December 1955. It has remained in Mr. and Mrs. Mellon's home in Virginia until now, with the exception of an exhibition devoted to their collection and that of Paul's sister, Ailsa Mellon Bruce, at the National Gallery in 1966. Mrs. Mellon donated the painting to the Gallery in 2013. Theo van Gogh, Paris [1857-1891]; his widow, Joanna van Gogh-Bonger [1862-1925], Amsterdam; (Paul Cassirer Gallery, Berlin); sold 1906 to Curt Hermann [1854-1929], Berlin; his son, Frederick [Fritz] Henry Hermann [1898-1983], Berlin and London; sold December 1955 through (Carstairs Gallery, New York) to Paul Mellon [1907-1999], Upperville, Virginia; bequest 1999 to NGA, with life interest to Mrs. Mellon; life interest released 2013. I. Ausstellung, Paul Cassirer, Hamburg; Ernst Arnold, Dresden; Paul Cassirer, Berlin, September-December 1905, no. 18 in Hamburg catalogue (no catalogue for Dresden and Berlin). Tentoonstelling van Schilderijen en Teekeningen door Vincent van Gogh, Stedelijk Museum, Amsterdam, July-August 1905, no. 433. Vincent van Gogh, H.O. Miethke, Vienna, January 1906, no. 14. Internationale Kunstausstellung des Sonderbundes Westdeutscher Kunstfreunde und Künstler, Kunstgewerbe Museum, Cologne, 1912, no. 42. Vincent van Gogh, Paul Cassirer, Berlin, 1914, no. 138. Vincent van Gogh Gemälde, Paul Cassirer, Berlin, 1928, no. 89. French Paintings from the Collections of Mr. and Mrs. Paul Mellon and Mrs. Mellon Bruce, National Gallery of Art, Washington, 1966, no. 135, repro. Van Gogh and Nature, Clark Art Institute, Williamstown, MA, 2015, no. 50, repro. Hermann, Curt. Der Kampf um den Stil. Berlin, 1911: 115. "Der Künstler und seine Welt: Curt Hermann - Berlin als Maler und Sammler." Deutsche Kunst und Dekoration 31 (1912-1913): 131-138, repro. Pfister, Kurt. Vincent van Gogh. Berlin, 1929: pl. 41. Faille, J.-B. de la. Vincent Van Gogh. New York and Paris, 1939: no. F. 807, repro. French Paintings from the Collections of Mr. and Mrs. Paul Mellon and Mrs. Mellon Bruce. Exh. cat. National Gallery of Art, Washington, 1966: repro. no. 135. Lecaldano, Paolo. L'opera pittorica completa di Van Gogh e i suoi nessi grafici. 2 vols. Milan, 1971: I:no. 859, repro. Hulsker, Jan. The Complete van Gogh. New York, 1980: no. 1980, repro. Feilchenfeldt, Walter, Vincent van Gogh & Paul Cassirer, Berlin. Amsterdam, 1988: 122, repro. Bothe, Roth. "Der Sammler Französischer Kunst." In Curt Hermann 1854-1929 Ein Maler der Moderne in Berlin. Exh. cat. Berlin Museum, 1989: 92, repro. 33. Gachet, Paul. Les 70 jours de van Gogh à Auvers : essai d'éphéméride dans le décor de l'époque (20 mai-30 juillet 1890), d'après les lettres, documents, souvenirs et déductions, Auvers-sur-Oise, 1959. Saint-Ouen-l'Aumône, 1994: 138, repro. Hansen, Dorothee. Van Gogh: Fields - The Field with Poppies and the Artists' Dispute. Exh. cat. Kunsthalle Bremen, 2002: 104-105, color repro. Korn, Madeleine. "Collecting Paintings by Van Gogh in Britain before the Second World War." Van Gogh Museum Journal 2002: 137. Bailey, Martin. Van Gogh and Britain: Pioneer Collectors. Exh. cat. Compton Verney, Warwickshire; Dean Gallery, Edinburgh. Edinburgh, 2006: 122-123. Van der Veen, Wouter, and Peter Knapp. Vincent van Gogh à Auvers. Paris, 2009: 140, repro. Vincent van Gogh -- Between Earth and Heaven: The Landscapes. Exh. cat. Kunstmuseum Basel, 2009: 270, repro. fig. 100. Boyle, Katherine. "National Gallery Welcomes Gift of van Gogh's "Final Gasp." Washington Post 137, no. 15 (December 20, 2013): C8, color repro. Vogel, Carol. "A Van Gogh Out of the Living Room" (Inside Art). New York Times) 163, no. 56,356 (December 20, 2013): C25, color repro. Morton, Mary. "Vincent van Gogh, Green Wheat Fields, Auvers" National Gallery of Art Bulletin no. 50 (Spring 2014): 20-21, repro.